The twin batting failure in the third Test has suddenly thrown up a lot of questions for India with two more matches in the series still to be played against a rejuvenated England side. Alastair Cook’s team looks firmly in the saddle after exposing India’s batting and bowling frailties in a comprehensive 266-run victory in Southampton that put them level at 1-1 in the five-Test series. India’s biggest problem on the ongoing tour is the poor run of their brightest batting talents. Shikhar Dhawan, Cheteshwar Pujara and Virat Kohli have time and again flattered to deceive, throwing their wickets away after getting off to good starts. Dhawan could well make way for the experienced Gautam Gambhir, who last played a Test in December 2012, for the next match at Old Trafford, starting August 7. The Delhi batsman’s most visible flaw is his inability to learn from his mistakes. True, he was out to good deliveries from James Anderson thrice, but the dismissals to part-timers Mooen Ali and Joe Root in the third Test must surely be hurting him, as much as it did the team. The left-handed opener has aggregated just 122 runs in six innings, at an average of 20 and a highest of 37, and will be lucky if he walks out to open the innings in the fourth Test. While the opening slot is a problem area for India, the lack of runs from their No. 3, Cheteshwar Pujara, and No. 4, Virat Kohli, has only compounded it. Pujara took over from the great Rahul Dravid, who scored runs by the ton at the No. 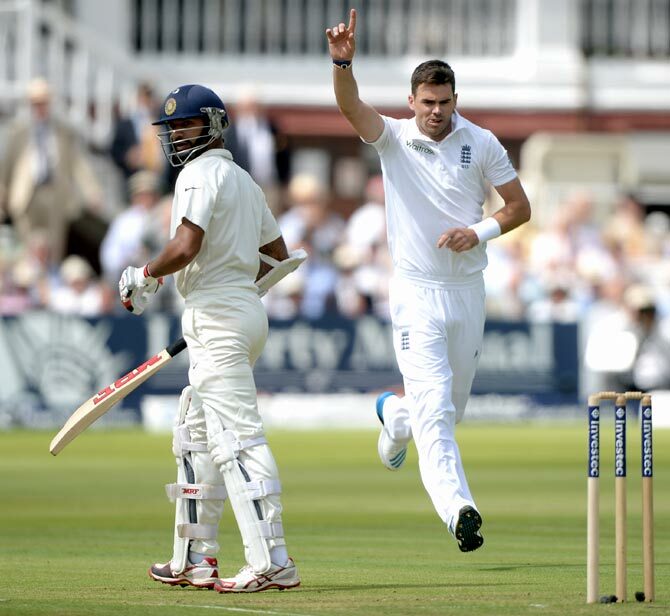 3 position, including three centuries on India’s last tour of England in 2011. Pujara, however, hasn’t been able to carry on after getting off to good starts. His tendency to lose focus under pressure has seen him gift his wicket away with poor shots. A return of 190 runs in six innings, at an average of 31 and just one half-century, only confirms that he has had a below-par series thus far. That four of his six dismissals were caught behind the wickets clearly indicates that he needs to work on his technique, especially when dealing with deliveries outside the off-stump. But the bigger issue the team is beset with is the poor form of batting mainstay Virat Kohli, who is yet to score a half-century in six innings on the tour. 101 runs in six innings, at an average of 16, is all he has to show midway through the series. 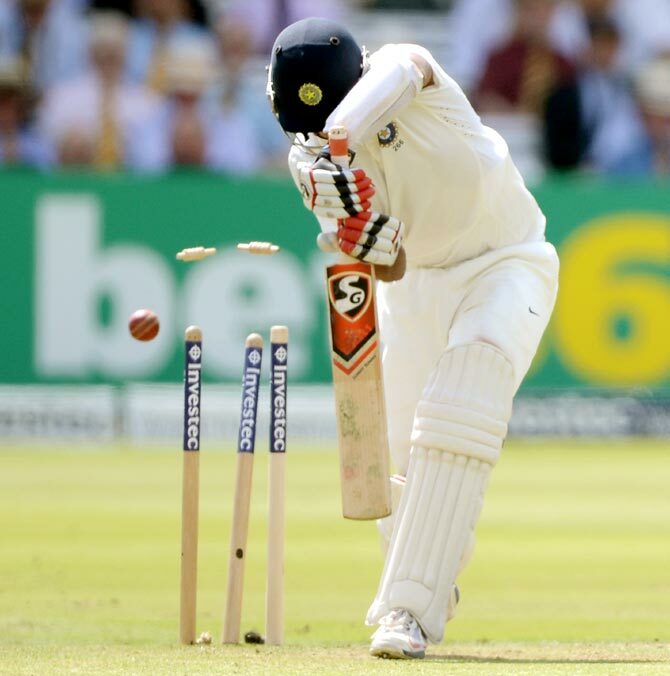 He started off with scores of 1, 8, 0, and looked like regaining form when he scored 39 and 38 in the third Test till his poor technique outside the off-stump saw him gift his wicket away. With India bundled out for 330 and 178 in the two innings at Southampton, and Ishant Sharma ruled out of the fourth Test too, it is clear the batsmen have their task cut out. The likes of Kohli and Pujara could do well to learn from team mate Murali Vijay, who’s been a revelation with the bat in England. All he has focussed on is getting the basics right while showing the desire and temperament to succeed in difficult conditions. Unlike Dhawan, Kohli and Pujara are in no danger of losing their places in the side. 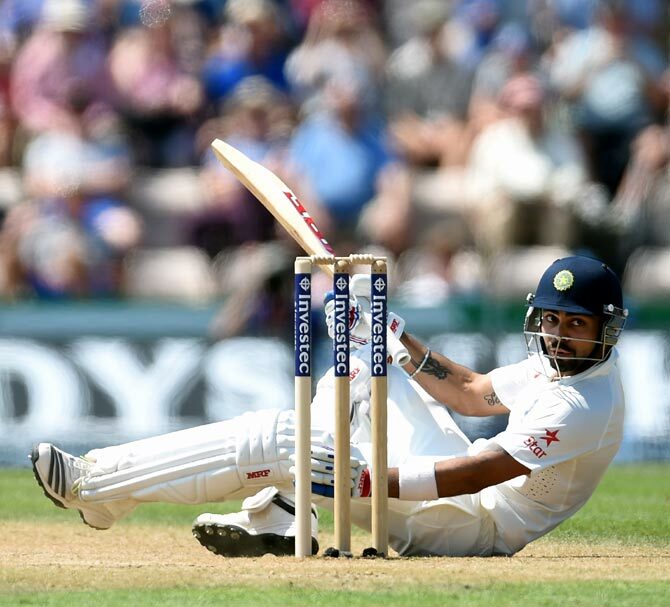 For India, though, a series defeat looms large despite being so dominant at Lord’s. India captain Dhoni hits new low! India underestimated, Moeen Ali retaliated!